It seems like everyone who saw my Christmas gifts to Brandy and Beka went gaga, wanting to know where I got such cute custom ornaments. The answer: Hamer & Clay. They aren’t just ornaments, they’re art. Completely custom pieces handcrafted to order – with whatever exact details you want – means that these are lifelong keepsakes. Don’t want to reserve them for just Christmas time? Don’t worry, Kelsey will soon be offering magnets too! Your horse could live on your refrigerator year round (I know they’d rather live IN it, but ON it is cool too). She can also do just about any other animal, including dogs and cats. With prices starting at only $16, you might as well order one to represent every animal in your life. Since H&C had to close 2014 orders early due to high demand, right now Kelsey is running a 15% off coupon on Hamer & Clay’s Etsy page for all orders over $20. The code is SORRY2014, and is redeemable until March 1, 2015. She is also in the midst of rolling out a brand new website at http://hamerandclay.com so keep an eye on that! If you want to look through tons and tons of pictures of her work, follow Hamer & Clay on facebook. Kelsey runs periodic giveaways through her facebook page as well! If you want to order some as Christmas presents, the sooner the better – she books up earlier and earlier every year. And it’s no wonder, with such beautiful and affordable pieces. Her detail work is just incredible. Kelsey was kind enough to take time out of her busy schedule to answer some questions about herself and Hamer & Clay! 1)When did you start this business? 2) How many employees are there in your company? entered my late teens to early twenties.One November day in 2011, I got the unmistakable urge to play with clay again, and thought; hmm I should revisit those old trophies I used to do. That was it, the ball got rolling and it’s been rolling slowly and steadily from then on. 4) What is your background in horses and art? level, obtaining a Bachelors Degree from Emily Carr University. months when all three jobs really pick up. and is active in our etsy shop.There are a few new products in the works for 2015, including fridge magnets and a special edition limited run of 10-20 for the 2015 holiday season. So order early, order many, enjoy your discount and pack your tree with all your favorite faces next Christmas! Thanks Kelsey for being so easy to work with… I ordered 7 ornaments and was beyond picky and specific about really tiny details. Not only was she very accommodating, she completely nailed it with every single one. Each one arrived beautifully packaged and they were such a joy to give to friends. Time for me to order some of my own horses! After seeing how good the ones you ordered turned out, I’ve made it a mission to get Simon and the 3 dogs done before Christmas next year. She does a fabulous job! i gaze lovingly at my ornament every morning when i make my coffee. i love it so, so much! definitely getting the kittehs immortalized, and maybe another one or two of auto! also, we should get one done to commemorate the derps’s bromance. Thank you Amanda. I really am thrilled you asked to feature Hamer & Clay on your fantastic blog. I am humbled to say the least! No problem! Love your work, you deserve some recognition! I will be buying some ornaments this year for sure. And probably some magnets, too. I don’t decorate for Christmas, but I’m definitely down for a magnet. 😀 I’ll be keeping my eyes open for those. Ooh i will have to take advantage of the offer & get ornaments made of my girls for my first Christmas tree. So that hopefully every year they can be the first decorations! She does amazing things with clay! I need to make sure to start ordering early for next year! These are 100% the most creative, adorable things I’ve ever seen. SO going on the wishlist! Gorgeous works! I am going to need to do my two! I’ve been waiting for this post!!! SO glad you encompassed a lot of things I missed when I featured her business on my blog. Lovely, lovely post. Those are gorgeous! I’ve already ear-marked it for my 2015 Christmas List!! I LOVE mine! It’s the best thing ever and the details are amazing! Now, I really want a jumping on and one of the girls. 🙂 Thanks so much, Amanda and Kelsey! 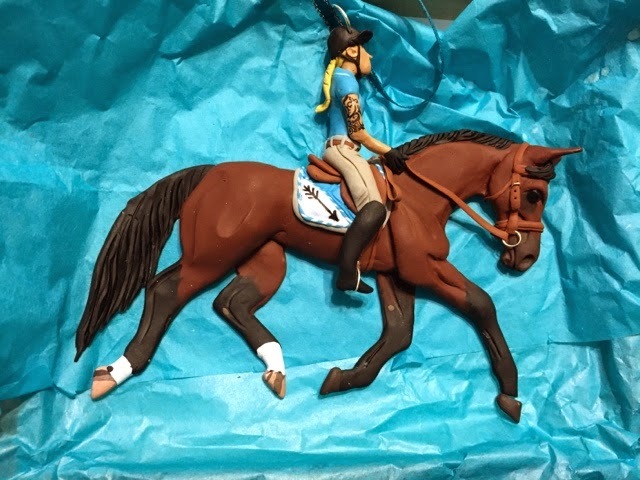 I purchased one for my trainer this year (you can see it here if you like: http://www.talesofanewbiehorsebackrider.com/2014/11/product-review-hamer-clay-custom-horse.html) and she was over the moon over it. Kelsey is hugely talented and I can’t recommend her enough. One thing that I found surprising about the ornaments is that they are pliable — if it was to drop on the ground it would not break. I guess that is polymer clay for you and I should have known that, but I was expecting it to be harder. I was really happy to know that the ornaments will no break if they fall from the tree, etc. Its true, i dropped one of the dog ornaments on a tile floor and it was totally fine! Good point. I want them ALL!!!! Definitely using the coupon, thanks for sharing! My friend commissioned one for me about 3 years ago. I LOVE it! These really are amazing presents…I will be looking into them for xmas this year! Def going to get some of these!! !